Hello from a beautiful sunny day here at the NE UK coast and I am hoping it is the start of a good week as we will be away until next weekend on the opposite coast for a change. 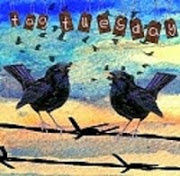 I do have a scheduled post for Tuesday and hope to have a little internet time to do the odd comment but not sure about that until I get there. 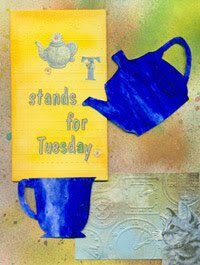 At Tag Tuesday we have the theme Anything Goes and still over a week to make a tag of your choice and share it with us or if you make a tag for another challenge add it to us as well. Always love to see what you make. I have two dancers and I hope you can feel the floating feeling that dance gives you. I danced for years and still would if I could find a partner. It really is the best feeling to float around a dance floor in the arms of someone who is doing the same thing. Vic has several 'left feet' unfortunately. I would like to add this to Digitally Made as my third entry as they have Anything Goes for their first challenge. Waue what a lovely tag, love that owl. 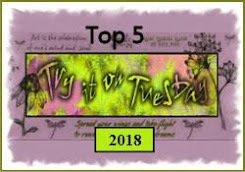 An amazing tag Chrissie - cool sewing with the hanging threads!A beautiful digital page - charming! 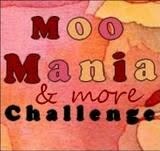 Thank you so much for joining Moo Mania & More again! ENjoy your weather - we have cold and rainy again since yesterday! Sad - but at least maybe nature loves it ! Thanks for entering our challenge a third time this month at Digitally Made! Interesting background behind your dancers and the animated twinkles are a fun touch. wonderful your dancer and very nice the Tag!!!! 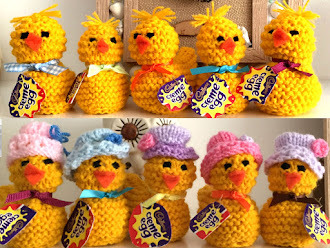 My goodness your owl is amazing, love it Chrissie and your fab digital project is just amazing. Thanks also for linking it to Digitally Made. First, I want to tell you how much I adore those beautiful dancers. As always, I am in awe of your digital skills. You are fabulous when it comes to that. I could take lessons from you, if I lived closer! Now for the owl. I adore how you colored the owl and it is a beauty. But the real reason I saved it for second is because I wanted to expand on what Valerie wrote. Your stitches need to be as long as possible so the threads don't bunch up on the paper. I use an 80/11 needle for paper to paper and a 90/14 titanium needle for heavy cardboard to paper. Don't worry that you will have to change the needles. They last forever, or until they break because you do something silly (OH WOOPS, that's ME doing something silly). Lovely work. 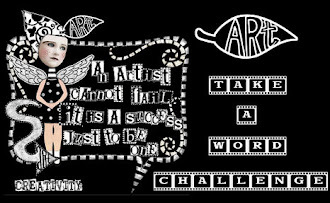 Thank you for joining the challenge at Digitally Made with your lovely digital dance card. Hope to see you again next time. 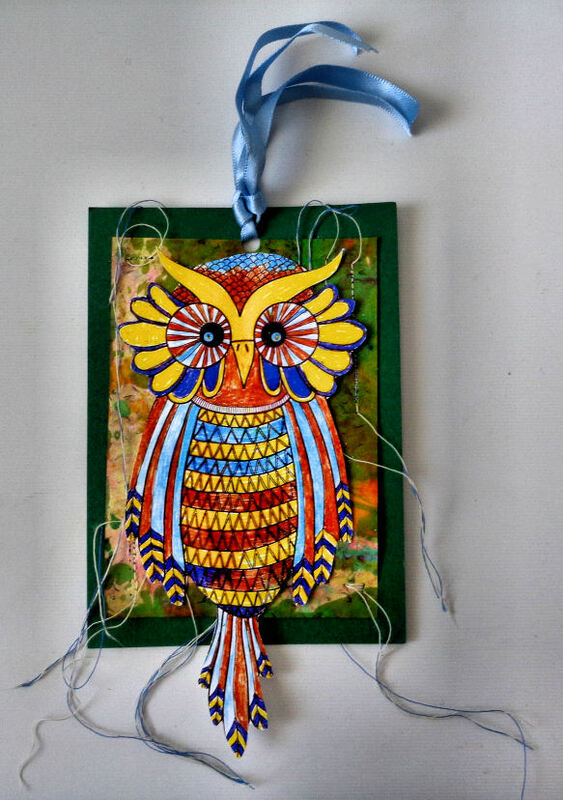 A GORGEOUS owl, fabulous colours, love the sewing too and your dancing creation is wonderful, love the sentiment. The owl is so bright and beautiful! The hanging threads are quite cool and add great texture!! I love the dreamy feel of the dancing piece - so lovely. Your Digital Page is a dream dear Chrissie, so sweet the two dancing girls. The owl tag is also well done. Another wise and wonderful owl - I love all those wild threads adding movement. And the dancers are lovely silhouetted against that magical background. Wow, Chrissie, I love your owl, just adorable, and your dancers are so beautiul. That owl has character and I think you did wonderful work on that tag! The color scheme really grabs ones attention. Please contact us at digitallymadechallenges AT gmail.com regarding your recent win. We'd like to offer you at guest designer spot next month. Thank you !